The arrival of spring kicks summer vacation planning into high gear – for many that means finding a vacation rental. 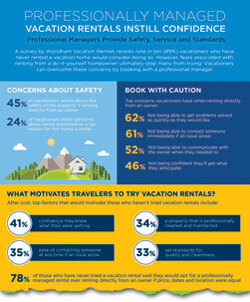 Before booking that dream vacation home, travelers need to think twice about who they rent from as it makes a big difference when it comes to safety, service and peace-of-mind according to a new survey from Wyndham Vacation Rentals. Nearly 90 percent of do-it-yourself hosts secretly dread doing the things needed to deliver a great vacation experience – dealing with guests, handling inspections and cleaning the house. As a result, nearly 70 percent of travelers who have tried both would prefer to rent from a professional management company as opposed to an owner during their next stay. The private space and home-like amenities of vacation rentals have strong appeal - 89 percent of those who never tried a rental would consider doing so - but tales of vacation rentals gone bad when booking directly with a homeowner weigh on renters’ minds. Unmet expectations. 62 percent of all vacationers worry about not being able to get problems solved quickly and nearly half (46 percent) are not confident that they’ll get what they anticipate when renting directly from an owner. Unsafe rentals. Nearly half (45 percent) of all vacationers worry about the safety of an owner-managed property. Guests want to vacation with confidence. Nearly half (49 percent) of all vacationers look for a name they can trust when booking accommodations. Nearly seven in 10 guests (68 percent) who have stayed in a professionally managed vacation rental and one managed by the owner prefer the managed option. No Complaints. Virtually all guests (99 percent) who stayed in a professionally managed home had a positive experience during their last visit. At Your Service. 95 percent of vacationers can think of at least one reason why they would choose to rent from a management company over the owner. Top reasons included the company resolving issues quickly and providing a 24/7 contact. Peace of Mind. Nearly half of all vacationers would choose a professionally managed rental over owner-managed because it provides greater peace of mind. Safety. Guests who have experience with both options are two and half times as likely to feel extremely confident in the safety of a home rented through a management company as opposed to one rented directly from the owner. While peer-to-peer listings may dominate the headlines, professionally managed properties account for nearly half of all transactions annually in the U.S. In fact, many of today’s most popular vacation rental listings are peppered with professionally managed properties. Unlike direct-from-homeowner rentals, vacation rental managers like Wyndham Vacation Rentals oversee the process from start to finish ensuring a great guest experience. Vacation rental managers have established standards for quality, service and security for their properties whereas peer-to-peer rentals leave the standards up to each individual homeowner. This study was conducted by Kelton Global from December 14, 2015 – January 5, 2016 among the following audiences: 1,000 nationally representative Americans 25+ who have ever traveled outside the home overnight, including 447 Americans who have experience being a rental guest in someone else’s vacation home and 561 Americans who own two or more homes and have ever rented out one of their homes to travelers (this group includes U.S. vacation rental homeowners who have a rental agreement with Wyndham Vacation Rentals and those who do not).